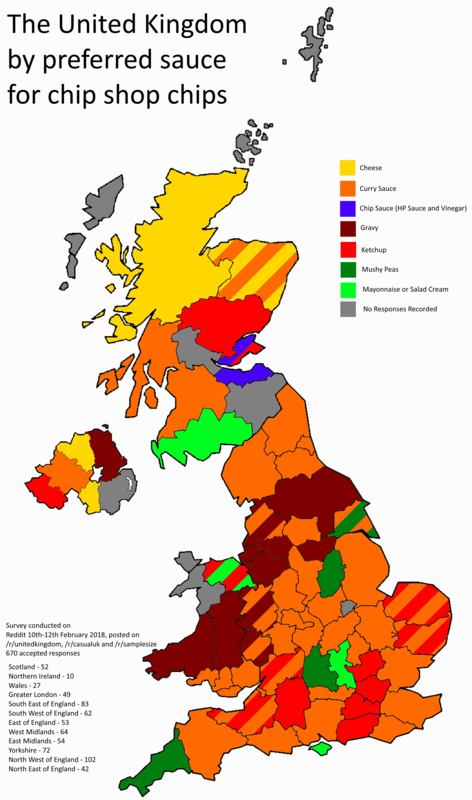 The map above shows the regional breakdown of which sauce, topping or condiment is the most popular for chip shop chips in the UK. The results are based on a reddit poll taken between 10-12 February 2018, which resulted in a total of 670 accepted responses. Observations include a distinct ‘Gravy Belt’ extending further than stereotypically imagined, curving into Mid/West Wales. I was a little surprised to see Merseyside, Greater Manchester and Cheshire be part of this, they are often said to be more Curry Sauce areas. Likewise, West Yorkshire, County Durham and Tyne and Wear would have been expected to be Gravy areas on this cultural assumption. Oxfordshire was an unlikely addition to the Mushy Peas belt, but we had enough responses to say this probably isn’t an outlier. Cornwall’s association with fish and chips by the sea as a coastal county with a large tourism sector probably explains their membership, while Nottinghamshire, East Yorkshire and Lincolnshire were expected to generally be Mushy Peas areas in any case. Ketchup was broadly more popular in London and the Home Counties, with some popularity in the South West as well. Cheese did best in remote rural areas such as the Scottish Highlands. The Canadians call chips, cheese curds, and gravy “Poutine” – and IT. IS. DELICIOUS.